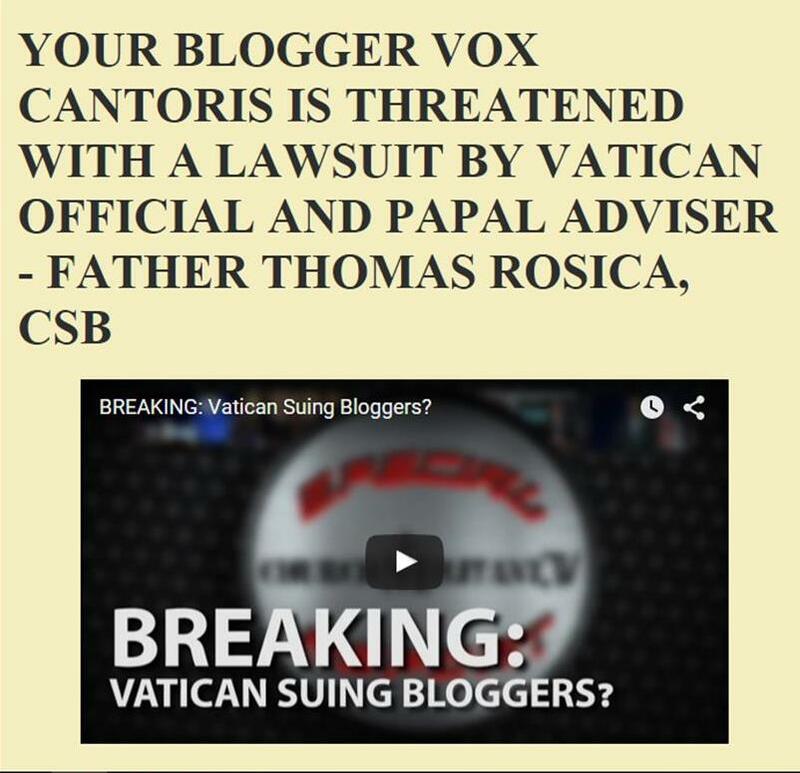 Vox Cantoris: Bergoglio invents a new sin! Bergoglio invents a new sin! The scandalous pervert protecting Bishop of Rome, Jorge Bergoglio has invented a new sin. The sin of denying that God has blessed other Christian communities with His grace. God has not, cannot bless heretical and schismatic Christian communities with his grace. God can bless individuals with grace through their baptism by water or even by desire. If He did not bless them, converts would not have sought entry into the One, True, Church outside of which there is no salvation. The papolaters out there will now take this and run with it as truth. Just because it emanates from the pontifical mouth does not make it truth. The pope's vapours do not have the scent of frankincense. Everything bar sin is a grave sin. I knew I had to check this out, for if Pope Francis says something is a grave sin, then I am probably committing it. Still, I don't think I will take this one into the confessional. Remember that the Pope had the authority to teach the faithful on matters of faith and morals. We do not question, we assent. Fortunately for us Bergolio isn't Pope so none of the crap he utters matters one bit. So I'm guessing Francis doesn't mind if I check out that "Christian" community presided over by lesbian priestesses that incorporate a little wicca in the celebration. What a wonderful Pope we have. Not. He supports you and blesses you, as he supported and promoted Tony Palmer, on whose burial as "Catholic" bishop he personally insisted. Check out this freak Kenneth Copeland hosting Palmer and his best buddy Bergoglio. Is this opposite day again? Vox, with all due respect, Protestants and Eastern Orthodox who love the Triune God and are faithful to Him will enter the heavenly kingdom before the most lukewarm Catholics, who mistakenly confuse mere group identity with salvation. Christ did say in the Gospel ,"Who is not against us is with us"to his Apostles when they complained of a man who was not of their company preaching and healing in His Name ,and asked Christ should they send him away. Dear Joseph, Yes they will, PROVIDED their ignorance is INVINCIBLE. If they consciously (pertinaceously) reject one iota of the Faith they have their ticket to hell. All protestants are per definition heretics, but if they are invincibly ignorant, they are material heretics (they don't know that what they believe is heresy), and they are guiltless of sin and will be saved THROUGH THE MERITS OF THE CATHOLIC CHURCH. I can't remember how the last bit works. It was once well explained to me, but I am getting geriatric. I would be grateful if someone would tell me again. Yet another in a long line of SAD (scandal a day) moments with Francis. It could be Francis Undoes Catholic Kinship Every Day. Dear Joseph, I get your point. He also said " They who believe will be saved; they who do not believe will not be saved." There is only one true Faith. The quote can be taken out of context like the protestants do: Sola fide. I believe in Christ! Great! Now I am saved! Now I can do what I like, because Christ has saved me and took away all my sins. I must sin mightily to make my sins worthy of the great price Christ paid to take them away. ! 1000 murders a day, or adulteries is fine. I AM SAVED BECAUSE I BELIEVE! The Bible is not for personal interpretation. Only the Church interprets the Bible for us. (St. Peter.) Remember EENS (extra ecclesiam nulla salus est) is a DOGMA of the Catholic Church. "Here, too... it is again necessary to mention and censure a very grave error entrapping some Catholics who believe that it is possible to arrive at eternal salvation although living in error and alienated from the true faith and Catholic unity. Such belief is certainly opposed to Catholic teaching. There are, of course, those who are struggling with invincible ignorance about our most holy religion. Sincerely observing the natural law and its precepts inscribed by God on all hearts and ready to obey God, they live honest lives and are able to attain eternal life by the efficacious virtue of divine light and grace. Because God knows, searches and clearly understands the minds, hearts, thoughts, and nature of all, his supreme kindness and clemency do not permit anyone at all who is not guilty of deliberate sin to suffer eternal punishments. Martin Luther: "Be a sinner, and let your sins be strong, but let your trust in Christ be stronger, and rejoice in Christ who is the victor over sin, death, and the world. We will commit sins while we are here, for this life is not a place where justice resides... No sin can separate us from Him, even if we were to kill or commit adultery thousands of times each day." (See Let Your Sins Be Strong, from 'The Wittenberg Project;' 'The Wartburg Segment', translated by Erika Flores, from Dr. Martin Luther'sSaemmtliche Schriften, Letter No. 99, 1 Aug. 1521. - Cf. Also Denifle’s Luther et Lutheranisme, Etude Faite d’apres les sources. Translation by J. Paquier [Paris, A. Picard, 1912-13], VOl. II, pg. 404; Emphasis mine). "Such is the nature of Catholicism that it does not admit of more or less, but must be held as a whole or as a whole rejected: “This is the Catholic faith, which unless a man believe faithfully and firmly; he cannot be saved”. This council] firmly believes, professes, and proclaims that those not living within the Catholic Church, not only pagans, but also Jews and heretics and schismatics cannot become participants in eternal life, but will depart "into everlasting fire which was prepared for the devil and his angels" [Matt. 25:41], unless before the end of life the same have been added to the flock; and that the unity of the ecclesiastical body is so strong that only to those remaining in it are the sacraments of the Church of benefit for salvation, and do fastings, almsgiving, and other functions of piety and exercises of Christian service produce eternal reward, and that no one, whatever almsgiving he has practiced, even if he has shed blood for the name of Christ, can be saved, unless he has remained in the bosom and unity of the Catholic Church. "Wherefore, in His divine wisdom, [God] ordained in His Church Unity of Faith; a virtue which is the first of those bonds which unite man to God, and whence we receive the name of the faithful - “one Lord, one faith, one baptism” (Eph. iv., 5). That is, as there is one Lord and one baptism, so should all Christians, without exception, have but one faith. "The declared enemies of God and His Church, heretics and schismatics, must be criticized as much as possible, as long as truth is not denied. It is a work of charity to shout: “Here is the wolf!” when it enters the flock or anywhere else."